Jason Plato has obliterated the Donington Park lap record on his way to scoring his first pole position of the 2014 Dunlop MSA British Touring Car Championship. The Leicestershire circuit had been a hive of activity and speed during free practice with lap times already dipping under Gordon Shedden’s pole position time from 2013. 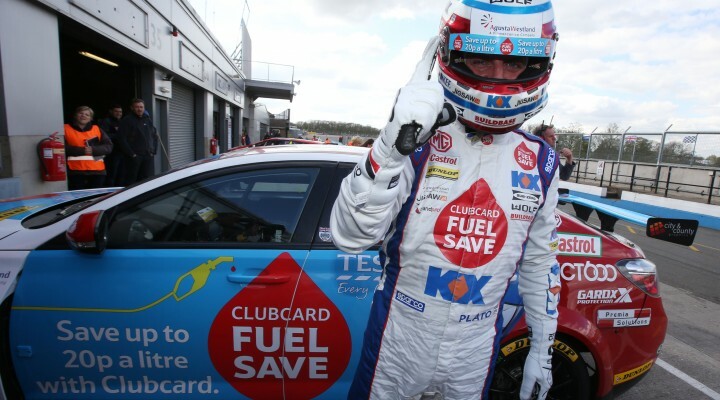 Many were predicting a record breaking qualifying session, and those predictions proved correct as Sam Tordoff first clocked a time in the 1m9s bracket before that was immediately bettered by his MG KX Clubcard Fuel Save team-mate Plato. After starting on the front row in each of the last four seasons at Donington Park, Shedden’s liking for the circuit clearly hasn’t diminished as the Scotsman also jumped Tordoff to take second. Shedden’s front row start will be the first for the all-new Civic Tourer, however, and will also be the first for an ‘estate’ style car in the BTCC. Tordoff, who is celebrating his 25th birthday today, will be slightly frustrated not to have matched his pace from free practice two, but third still represents a good opportunity for the Yorkshireman to target his first podium of the season. Colin Turkington went about his business in the usual professional manner and although the eBay Motors BMW failed to trouble the fight for pole position, the Ulsterman produced a stellar effort to jump ahead of both VWs to take fourth. Aron Smith and Alain Menu will still line up an impressive fifth and sixth respectively, but such was the pace of the CCs during practice that the Chrome Edition Restart Racing drivers will be slightly disappointed not to have made either of the first two rows. They did benefit from a rival’s misfortune, however, when WIX Racing’s Adam Morgan had all of his lap times removed from the classification after his Mercedes failed a mid-session ride height test. Morgan had seemed cemented in a fantastic fifth, and although he had time to correct the issue and return to the circuit, he went on to face further late heartache. The A-Class driver set a time good enough for 17th late on and with one final flyer remaining before the chequered flag fell he looked likely to rise further still, but he unfortunately lost control of his machine at Redgate and ran off the circuit. Morgan’s loss was Andrew Jordan’s gain as the ballast-laden Honda Civic took an encouraging seventh and he will line-up alongside Jack Goff’s Vauxhall Insignia for tomorrow’s opening race. Matt Neal – also running with significant weight due to his current second place in the drivers’ standings – took ninth, whilst Marc Hynes confirmed the pace of the MG6 by rounding out the top ten. Click here for a classification of qualifying from Donington Park.